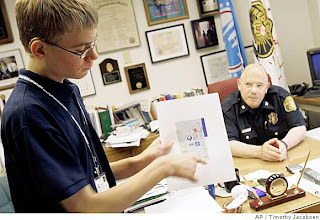 Robert Harris at the Frederick, Md., police dept. I posted this story about a month ago, but it is nice to see it getting some play around the country. It was in the San Francisco Chronicle on July 20. In other police news, The Boston Globe reports that texting is becoming an anti-crime method. It is especially helpful for deaf residents who might want to report a crime. A deaf resident alerted Chelsea, Mass., police to an assault and battery in progress with a text message, The Globe reports. The Chelsea Police Department is introducing a system allowing people to anonymously send tips on crimes and investigations via text message, called Text-For-Tips. The system should be in place in the next few weeks. It will also allow anyone to remain anonymous when providing tips to police. "Any time [tipsters] want to remain confidential and they have information that they feel would further a police investigation, whether it's ongoing drug activity, ongoing gang activity, information on the whereabouts of one person, this would be an invaluable tool for us," Police Chief Brian A. Kyes said.